Farrel O’Shea is a legend within the windsurfing world and was a hard charging wave head from back in the day. As a professional sailor he competed all over the place and was one of the first Europeans to nail the Holy Grail of windsurfing moves – the forward loop. These days Farrel still loves a bit of windsurfing action, in the form of speed sailing (and he’s no slouch either), but devotes most of his time to the O’Shea Surf brand. Producing a range of kit O’Shea SUPs have gained reputation as quality pieces of equipment (check our reviews section for reports on multiple O’Shea inflatable SUPs) so we thought it high time we get the low down on the brand from the main man himself. 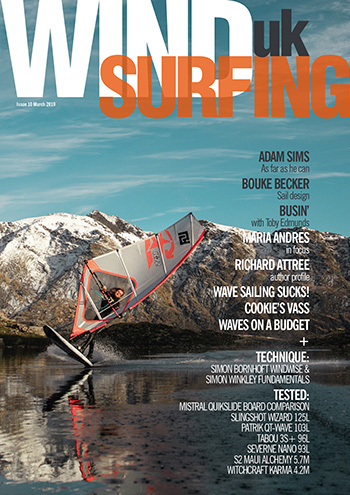 I am from a windsurf background – a survivor of the ‘big times’ in windsurfing, the infamous 80’s! Still windsurfing now on the blowing rascal days but concentrating more on going fast rather than wave. I saw some boards whilst visiting a friend of mine, Clyde Beatty, at his shaping factory. I think it was about 2003-2004. Very early days in SUP. I hadn’t seen anyone on the water at all until that point. I saw a few pics of laird Hamilton. Can’t remember the exact point in time but thought I would give it a go. It doesn’t really take much learning – right?! A few minutes and you’re up and running – that’s the beauty of SUP and that’s why it’s growing fast. Many – I wouldn’t know where to start. Not sure I have any? Chris Bertish is always doing something interesting though. Sonni Honschied is great too. By default I windsurfed with her father Jurgen many moons ago. What about land based activities – anything that gets you frothing like a silky offshore wave or buttery smooth flat water? We are not land people. Or is it that I’m not very good at anything on the land? When did you decide to start making stand up paddle boards? The first boards we made were in 2004 – hard boards to start. As I recall we made about 30. I was really convinced it was going to be a future sport for all. We really struggled to spread the love. I could only find a couple of retailers that saw any prospect. Dave at Funsport and Ian at Boardwise – nobody else had any confidence to back SUP. Things remained like that for some years – it was a slow burner to start with and took us what seemed like ages to sell those initial boards. What designs do you focus on mainly? We are inherently board sport designers so I love all aspects of board design. I think our forte is inflatable. Too many companies put almost no time or effort in here – even some of the bigger players. Our R&D has been intensive and time consuming, but it’s really helped us keep at the forefront of a blow up world. 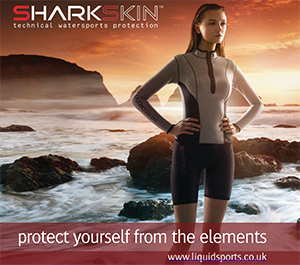 Talk us through your day to day responsibilities – is it all paddling, testing and designing or do you have to input in other areas of the business? Day to day I’m the one making the big decisions on all aspects of O’Shea hardware. Our focus has always been quality and it’s my job to maintain that legacy for our brand. 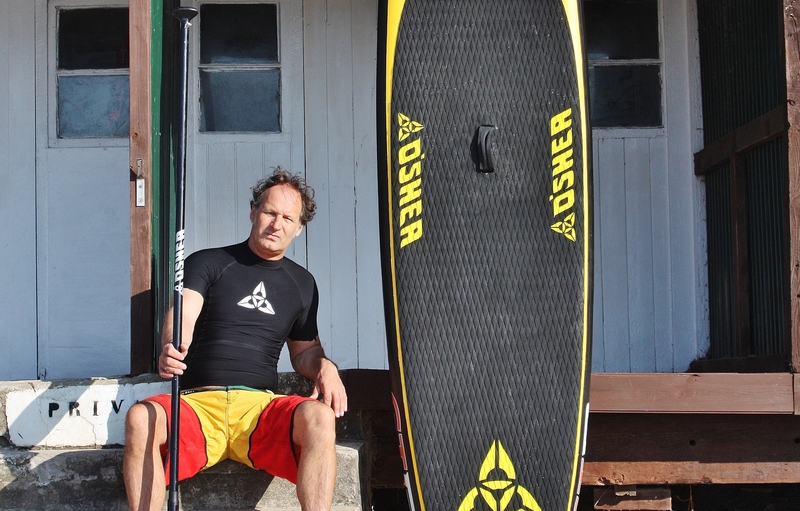 I’m very fortunate to have made and tested thousands of prototypes in windsurfing, surfing, wetsuits and now SUP. I haven’t wasted those 35 years at the beach and on the water – not all of them anyway! In terms of change, how’s the sport moved on in the UK since its inception? Is it easier to sell SUP gear nowadays? 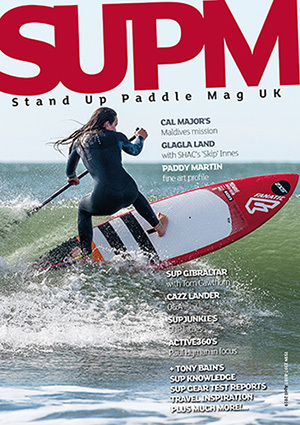 SUP now is a sport for all – a water user that we have never seen before. In many disciplines we have always been ahead of the curve, so it’s difficult to judge how it’s moved on. But yes the market is strong right now – particularly if your product is good and a sensible price. Tell us about how you plan on developing the O’Shea brand – what ways do you see the company evolving? As a company, and because we are always super actively involved, I think we can read and evolve in the market. I think our distinct advantage is that we prioritise product over the profit. Most of our competitors are run by bean counters and driven by money. I never forget O’Shea is a lifestyle company and that’s what I like our customers to feel they are involved in. Simple answer: 10.6ft inflatable. It’s a good consumer board, an uber stable paddling platform, well built and durable. It’s also a go to school or hire board for many shops and centres. We aim to make the best – that’s always our goal. I’m always disappointed to see brands or retailers popping up making poorly designed and poor quality products. As the sport gets logistically grown most of these 15 minute brands making low quality product will simply disappear. These fast buck merchants are doing no one a favour, least of all the consumer. Out of date shapes, cheap Dropstitch material, single skin and so on. Buy cheap – buy twice! Using everything we make and trying as many other brands when I have the chance! Then I can bench mark where we are up to. My particular favourite is our 11.2ft GT iSUP. We are based in Abersoch, North Wales. It’s a great location for paddling and testing. We have waves at Hell’s Mouth, open water in the bay and super flat inside the marina – it’s about 20 meters to the water from our office door. I love our own backyard – that’s why we live there. It’s interesting vista wise and super varied. We have Snowdonia as a back drop, clean water and on a lucky day dolphins sharing the experience. I’m not paddling that much wave right now – that may be a better winter project. We may be doing some wave development on Fuerte when it gets a bit too cold here. I’m more than happy to paddle anywhere! I’m only paddling for the craic so my ambitions are by definition just sociable and smiley faced – it’s that simple. Any final thoughts on SUP or O’Shea?